I want to teach you a lesson in how to use doodles to think through strategies yourself. It all starts with getting your ideas on paper. But how do you do that? So many people say, "Whatever you do don't ask me to draw, I'm terrible." What I tell the students of the Doodle Institute is that "doodling" is not about drawing; it's about IDEAS. 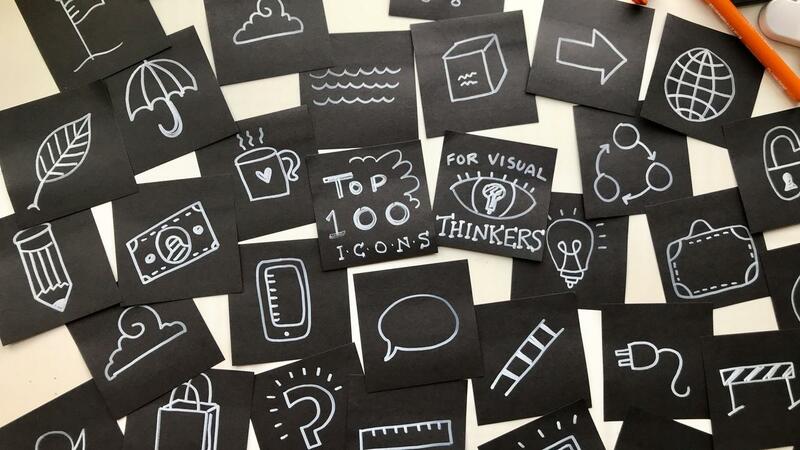 To help you get started getting your ideas on paper, I created a list of the TOP 100 ICONS I have found myself using over and over with my clients. I want to share these icons with you so you can start to unlock your creative thinking skills too. Print out the TOP 100 ICONS below. Grab a stack of sticky notes and practice drawing one icon per stick note. Now add a word to describe each icon. Some icons you could use more than one word just use the word that feels best to you. Display the post-its for others on your team to see. And if they ask what you are doing, "Say, I am building my visual vocabulary so I can make a better business model for our company wanna join me?" With your friend or co-worker start to look at the different icons, which ones could you use to describe a process within your business. 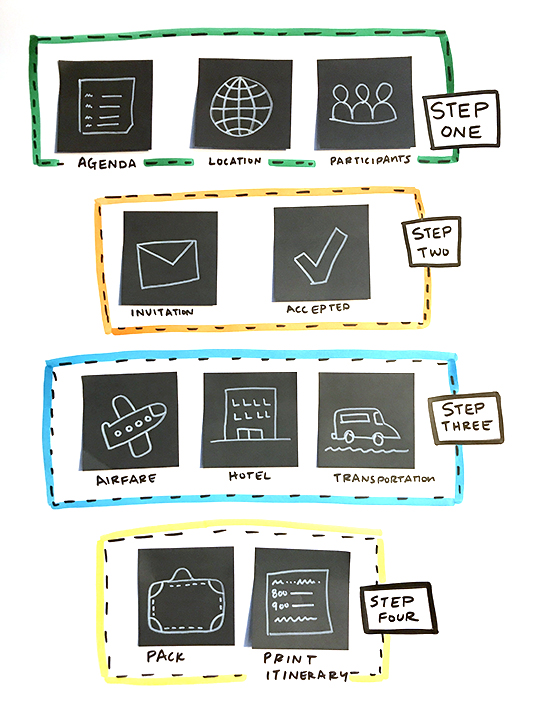 Say you are planning an offsite event, could you use some of the icons to map out the process for preparing for your off-site meeting (see example below). I promise you once you start playing with your business model in a fun and visual way, you will see hundreds of ways you can use them simple icons to work visually. So grab a pen, some paper, and let's get started! Become a Member of the Doodle Institute Today!